My reaction was a mix of “WHAAA?” and “holy crap, awesome!” I’ve been wanting to try an aged beer for as long as I can remember. There’s plenty of evidence that some mature extremely well, and plus it would be cool to drink a little piece of history. Unfortunately, all the beers I’ve tried to age have mysteriously disappeared after a month or so. I think I have ants. Big ones. They can carry 10 times their body weight, you know. Anyway, I got the beer home but decided to do some research before cracking it open. Since the bottle says it was brewed in San Francisco, I decided to start there and let my old friend the Internet fill in the blanks. Apparently, the building where this beer was made had been pumping out beer (in one form or another) since the 1800s. According to American Breweries II by Dale P. Van Wieren, however, it didn’t become Burgermeister Brewing until 1959, and in the ’60s actually became a division of Schlitz. Then it was bought by Meister Bräu, once the most popular beer brand in Chicago, which by that time was going bankrupt. 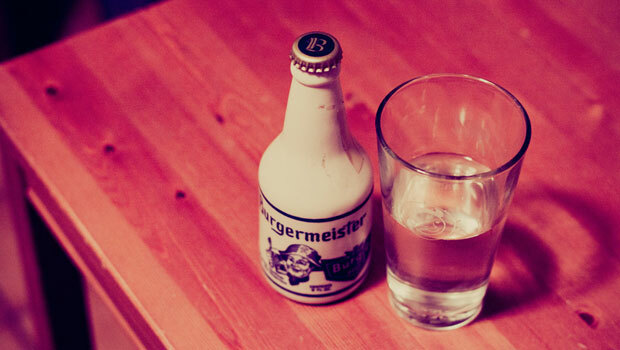 As a result, Burgermeister was soon purchased by Falstaff Brewing Corporation. After that, who knows? It seems to have closed down in the late ’70s, but I couldn’t find much more info. I’m sure it’s out there, but based on my Google intel, this beer simply disappeared. Except for bottles like this one. One last thing before I open it — don’t confuse California Burgermeister with the pilsner of the same name brewed in Illinois around that time. (It was nicknamed Burgie beer, even though this bottle has Burgie on it too. Now I’m seriously confused.) From what I saw online, the San Francisco Burgermeister also made ales, so I have no idea what kind of beer this will be. Should be an adventure. I grip the bottle and pry off the cap. It comes loose a little easier than expected. Beneath it, the rim is encrusted with nasty brown stuff, which doesn’t instill a ton of confidence. Nonetheless, I lift it to my noise and smell … nothing. Just blankness, even though I can feel something sloshing inside. I tilt the bottle above my glass, and crystal clear liquid pours out. Huh. No foam or anything. What the hell? Maybe it turned to vinegar? No … beer vinegar isn’t clear like distilled white vinegar, and besides, vinegar has a fairly distinct nostril-searing smell. Whatever. I’m sick of wondering. I lift the glass and take a sip. Well … that was unexpected. So what the hell just happened? I like to think it’s some kind of twisted joke. Some guy from the ’70s conceived this diabolical plot to make me suffer. I can almost hear him trying to explain it to his friends. In all fairness, if the beer was a pale American pilsner, maybe all those years finally pushed it out of the canoe and turned it into water. Or this could’ve been the result of a weird mishap where someone drank the beer and decided to reuse it as a water bottle. No, wait, that’s the stupidest idea ever. You’d have to take a bottle opener, unused caps, and a resealing device with you wherever you went. I don’t know how to explain this. The whole thing baffles me. All I know for sure is that I’ll have to keep waiting to try that aged beer. But I guess that’s sort of the point, isn’t it? It’s ok to laugh. I did. After I finished cursing. My Great Uncle Herman Lunsmann was the President of Milwaukee Brewing in San Francisco. He came to the City in 1885 with his two brothers and all were in the liquor business. He owned a “club” on Market near apoerll called The Charleston. My Great Grandfather had a saloon right off Union Square . I have found all their addresses in old phone records Both businesses lost in the earthquake and fire. Their other brother lost his saloon and store also. My Great Grandfather reopened his saloon “Lunsmann Saloon”. It was on the corner of spill and Pine. Uncle Hermann bought (?) Milwaukee Brewing soon after the earthquake. When prohibition came there are patents pictured and described on the internet he applied for under different names for malt beverages. He owned it until his death in the early 1940s. We were a very close family . Sorry for the typos! The Charleston was on Market a half a block from Powell. Could your coworker have played a trick on you? I suppose it’s possible, but I don’t think so. He seemed genuinely shocked and confused when I told him what happened. And I’d think succeeding with a prank like that would come with gloating rights. Maybe someone was playing a trick on the co-worker…. That is interesting – what style of beer was it originally? I’m actually not sure. At first I thought it was the pilsner known as Burgie beer, but that seems to have been made by another brewery. It doesn’t say on the bottle, and I’ve found evidence online that this brewery also made ales. If anyone knows for sure, please leave a comment. I’d love to find out what I missed. It was a refreshing light brew. A real San Francisco favorite, for quite a while. Advertised on all the local sports events, IE Oakland A’s and SF Giants, Warriors, raiders and 49ers. All had Burgie ads! What actually happened to Burgermeister in 1972 was Hamms bought the beer label and Falstaff bought the brewery( This was actually televised on local bay area news in the spring of 1972 the day the brewery shut down). Burgermeister continued to be brewed for a few more years in San Francisco just down the street at the Hamms brewery. In 1975 Hamms sold out to Olympia so it and Burgermeister were brewed in Washington, in the late 70’s Burgermeister was sold to the Blitz Weinhard brewery. Years later G Heileman makers of Mickeys Malt liquor picked up Burgermeister and eventually Pabst bought that too along with Olympia. I would say by the 90’s Pabst all together dropped the Burgermeister brand and by then after 5 different ownerships I’m sure the beer didn’t even resemble what it tasted like when brewed at the original brewey rin San Francisco. I have another unopened bottle in my antique booth. Want to try again? Make me an offer.